NeXgen Fuel partnered with Eco Trek to fuel its “Eco-Expedition vehicle”, a Chevy Colorado with NEXDIESEL Renewable Diesel during its coverage of SEMA and the Baja 1000, including environmental programs in Baja. Learn more about Eco Trek, its Educational Outreach, Research Sharing and Events/Tour Schedule at Ecotrek.com. Memo Terrones, Golden Gate Petroleum driver, returns a nozzle to the fuel truck after a Capitol Corridor locomotive is filled with renewable diesel at the Amtrak Maintenance Facility in Oakland. This is reposted from the San Franciso Chronicle. Story by Isha Salian | September 14, 2017 | Photos by Lea Suzuki. Renewable diesel sounds like a contradiction in terms. But planners for the Capitol Corridor trains, which run between the Bay Area and the Sacramento region, see it as a way to slash climate-warming emissions. “It’s pretty exciting for our industry,” said Jim Allison, manager of planning for the Capitol Corridor Joint Powers Authority. On Aug. 28, a train between Oakland and Auburn began running entirely on the fuel from Golden Gate Petroleum of Martinez — part of a test that, if successful, could herald its use throughout the Capitol Corridor system and in trains statewide. The Bay Area is rapidly becoming a center for renewable diesel, which can be made from vegetable oils, restaurants’ oil waste or animal fats — material known in the industry as biomass. Unlike biodiesel, which has to be mixed in with petroleum diesel, the new fuel can go into a tank at 100 percent strength. The cities of San Francisco and Oakland and the San Jose Unified School District have begun using it in their vehicle fleets, and operators of San Francisco Bay ferries are looking at it too. “We can sell every drop of renewable diesel we make,” said Eric Bowen, head of corporate business development for the Renewable Energy Group. The company sells the fuel mostly to the California market, he said. Its Louisiana plant can produce 75 million gallons of renewable diesel each year, and it is looking to expand its facilities. Demand for renewable diesel has soared. In 2011, 2 million gallons of the fuel were used in California, according to the Air Resources Board, which sets rules for emissions and climate change in the state. In 2016, it was 250 million gallons — about 7 percent of all liquid diesel used. California’s interest comes largely because of a policy called the Low Carbon Fuel Standard, which requires a 10 percent reduction in the carbon intensity of transportation fuels by 2020. Simon Mui, senior scientist at the Natural Resources Defense Council, said that depending on what the renewable diesel is made from, it can cut lifecycle greenhouse gas emissions by 15 to 80 percent. (Lifecycle emissions include growing the raw materials that turn into fuel; transporting and processing it; and finally burning it.) Renewable diesel also reduces fine particle pollution and other types of emissions, like nitrogen oxides and carbon monoxide, Mui said. on a Capitol Corridor locomotive to be tested. Some experts question how much the renewable diesel market can grow. “The more we study biofuels, the less clear it is there’s very much of a sustainable supply,” said Daniel Kammen, a UC Berkeley professor who helped write California’s Low Carbon Fuel Standard. Biofuels are always less efficient than electric vehicles, he said. Proponents of renewable diesel point out that while passenger vehicles (which mostly run on gasoline, not diesel) seem likely to go electric in the near future, a more sustainable diesel may be a good option to reduce emissions for larger, heavier vehicles — at least until more powerful batteries are developed to make electric trucks and buses cost-effective. Neste, a Finnish company that is the world’s leading producer of renewable diesel, makes between 800 million and 900 million gallons each year. The company said a major limit to growth is competing with the traditional diesel industry. “They’ve got an 80-year head start on us,” head of North American public affairs Dayne Delahoussaye said. Propel Fuels, a Sacramento company that operates 32 retail locations selling renewable diesel, says it keeps its prices competitive with petroleum diesel. “We don’t think a market exists for premium-price renewable diesel,” said CEO Rob Elam. Elam said Propel has a large presence in disadvantaged communities, serving customers who want to choose cleaner fuels but cannot afford electric vehicles. Other renewable diesel customers pick the fuel for higher power and mileage, he said. Richmond resident James Clappier has been using renewable diesel from Propel Fuels in his 1994 Dodge Ram 2500 since the company began stocking the fuel in 2015. “I need a large truck for my business, but feel bad for using such an inefficient vehicle,” he said. Capitol Corridor trains have been testing diesel alternatives for a few years, and its switch last month to 100 percent renewable diesel for the Oakland-Auburn run makes it the first train in the state to run on the fuel, Allison said. If further tests go well, all Capitol Corridor trains could switch over to renewable diesel by next summer, according to Dean Shepherd, manager of mechanical services. Allison estimates that shifting to renewable diesel in all of its locomotives, which each need about 70 gallons of fuel per hour, would reduce the trains’ greenhouse gas emissions by two-thirds. He is optimistic that testing will go well. “If there were any issues, we’d see them quickly,” he said. Pat O’Keefe, President and CEO of NeXgen Fuel clears the air and gives the facts about Renewable Diesel and Evan Speers, Chief, Office of Fleet Asset Management, Department of General Services, State of California shares insights on how effectively Renewable Diesel has turned the State’s fleets GREEN. Learn about the vehicle omission benefits of renewable diesel and how it differs from biodiesel. As a 100% drop-in fuel, renewable diesel offers GHG and criteria pollutant emissions reduction without any infrastructure or vehicle modification required. Leading agencies are already seeing its potential and use in the medium- and heavy-duty transportation space as a way to displace fossil diesel. Learn from leading renewable diesel experts so you can understand whether it makes sense for your fleet. First time in racing history! NeXgen Fuel/GGP/Safecraft/CLP Motorsports’ sponsored Trophy Truck #20 runs NEXDIESEL Renewable Diesel! *Subject to change, check local listings. Ensenada, Baja California, Mexico – The season finale of the four-race 2016 SCORE World Desert Championship ended Sunday, November 20, with overall winners Rob MacCachren and Jason Voss in the spotlight, defeating 270 starters in cars, trucks, UTVs, motorcycles and quads. Among 31 starters in the SCORE Trophy Truck division, Safecraft’s Andy McMillin and Larry Roeseler in Trophy Truck No. 31, placed seventh in class and seventh overall four-wheel to finish, while Tyler McQuarrie and Pat O’Keefe pushed Truck No. 20 to the limit by running NeXgen Fuel’s NEXDIESEL Renewable Diesel—the first time in racing history – in a new V6 Ecodiesel engine. This year’s SCORE World Desert Championship was a loop race that started and finished in Ensenada, Baja California, Mexico, 65 miles south of the U.S. Border at San Diego. Through a beautiful and often treacherous desert landscape, over boulders or miles of dirt coupled with extreme temperatures, drivers are mentally and physically challenged as they race across vehicle-destroying terrain. The Baja 1000 is truly one of the world’s toughest and grueling races known to man. It is an experience like no other, which has captivated award-winning documentary filmmaker Dana Brown in the latest film, due out mid-2017, entitled “Dust2Glory.” The documentary is a sequel which chronicles all four races in the 2016 SCORE Desert Championship featuring interviews with Andy McMillin, Larry Roeseler, Pat O’Keefe and Tyler McQuarrie. “Dust2Glory” is scheduled for release mid-2017. From award-winning documentary filmmaker Dana Brown, Dust2Glory will chronicle each of the four races in the 2016 SCORE World Desert Championship. Brown’s original Dusty to Glory, released in 2005, became an iconic classic showcasing the legendary SCORE Baja 1000. Now, D2G, which began shooting at last year’s SCORE Baja 1000, and is continuing up close and personal coverage capturing the robust racers in their amazing adventures in Mexico’s majestic Baja California peninsula through all four spectacular 2016 races ending with this year’s 49th SCORE Baja 1000. It is scheduled for theatrical release in mid-2017. Pittsburg, Calif. – NeXgen Fuel, provider of “NEXDIESEL,” the best alternative renewable diesel on the market and Safecraft Fire Suppression Systems, the racing industry’s standard for fire safety for over 20 years and have teamed up in a double sponsorship of two Trophy Trucks at the 49th Anniversary of the Baja 1000, Nov. 16-18. While 5-time Baja 1000 champion and recent Best in the Desert’s Vegas to Reno winner Andy McMillin and ‘The Legend’ Larry Roeseler, 13-time Baja 1000 champion and Off-Road Hall of Famer rally behind the wheel in McMillin’s TSCO-built Trophy Truck #31, Tyler McQuarrie, one of the world’s best multipurpose drivers and veteran-racer Team Owner Pat O’Keefe will also vie for victory in NeXgen Fuel’s Trophy Truck #20, built by CLP Motorsports. Not only will this be the first time the two most victorious and notorious Baja 1000 Trophy Truck drivers are teaming up–immediately making them a pre-race favorite— it’s also the first time in racing history a Trophy Truck will run on NeXgen’s NEXDIESEL Renewable Diesel to demonstrate the high-performance characteristics of one of the most dynamic fuels made from renewable and sustainable raw materials. Safecraft Safety Equipment is the leading provider of fire suppression systems and is used by most of the top professionals in a wide range of industries including Motorsports, Automotive, Aviation and Marine. For over 20 years, Safecraft is known for its innovative design and use of the highest quality components available. Visit www.safecraft.com for more information. NEXGEN Fuel is dedicated to distributing and marketing the highest quality, next generation fuels to private and public fleets, consumers and environmentally-conscious organizations. The first NEXGEN Fuel to be offered is NEXDIESEL Renewable Diesel, a superior quality diesel fuel. Learn more at www.nexgenfuel.com. NEXDIESEL Renewable Diesel by NeXgen Fuel is produced from 100% renewable and sustainable raw materials. (Note: It is NOT Biodiesel, a common misperception). This low carbon fuel has the same chemical properties as petroleum diesel and meets the petroleum diesel specification (ASTM D975) yet is petroleum-free. This premium quality, dynamic fuel allows fleets to seamlessly switch without additional investment or engine modifications. In addition, renewable diesel burns cleaner equating to a reduction in maintenance costs and a significant reduction in emissions. Andy McMillin is a third generation off-road racing prodigy. Andy’s passion for off-road racing began at the age of 2 when he started going to Baja to “pre-run” the race courses in the back of his dad’s Ford Bronco in a modified car seat. His racing career began at the age of 14 driving Class 1 Unlimited Buggies in the FUD series in Plaster City, CA. Andy officially drove his first SCORE Baja race in 2003, where he and his family were featured in the ‘Dust to Glory’ film. In 2006, Andy progressed to the premier Trophy Truck class and that same year became the youngest driver to win the Baja 1000 Overall title. At just 29 years old, he is tied for most Baja 1000 Overall titles in a four-wheel vehicle in the history of the sport with five (2006, 2009, 2011, 2014, 2015). Andy is also one of the few drivers in the sport who have won Baja’s Triple Crown Overall in a four-wheel vehicle: the San Felipe 250 (in his Class 1 car), Baja 500 and Baja 1000. Andy has had success in the United States races as well, having won the Parker 425, Nevada 1000, Vegas to Reno 1000 and is one of the few drivers who have won the infamous Mint 400 Overall twice. Andy has an unheard of winning percentage of 35% and podium percentage of 54%, proving his place amongst the greatest the sport has ever seen. SCORE Journal Cover Story, Sept/Oct 2016 ‘Mr. Baja’ Larry Roeseler: www.score-international.com. Tyler McQuarrie grew up in Walnut Creek, CA and started racing karts when was 14. He won the Formula Russell Championship and the Russell Triple crown in 1998. McQuarrie is the 3rd and only American to win the World Scholarship in England and then spent 2 years racing formula Vauxhall in Europe. He has also spent time racing USF2000, American LeMans, USAC Sprint cars and NASCAR West Series. McQuarrie has since become one of the top drift drivers in Formula Drift and is also one of the best multi-purpose drivers in the country. In 2016, Tyler competed in Formula Drift, Trophy Truck, Stadium Super Trucks, ARCA, IMSA, and NASA as part of his #RaceEverything campaign. Pat’s successful corporate career as President and CEO of NeXgen Fuel and Safecraft Safety Equipment, Vice President of Golden Gate Petroleum and CEO and President of CLP Motorsports had its humble beginning as a successful racer in his youth. His passion for automobiles and motorsports lead to an impressive racing career starting at the age of 12 where he has since raced anything with an engine including jet skis, boats, motorcycles, karts and cars with NASCAR, SCCA, NASA, IMCA and others. Pat started CLP Motorsports after realizing the need for a world class customer-focused motorsports shop. He started NeXgen Fuel by recognizing the need to meet customer’s demands for a high quality, clean-burning, high performance premium renewable diesel. Pat is continually driven to find innovative ways to champion clean alternative fuels like NEXDIESEL Renewable Diesel for use in the automotive industry. Contra Costa County, Calif. has switched from biodiesel to R99 renewable diesel to fuel many of its heavy-duty diesel vehicles, including more than 220 diesel-powered municipal public works trucks, specialty vehicles, and equipment. In making the switch, the county expects to reduce greenhouse gas (GHG) emissions by up to 65% and an estimated 5,000 tons annually. Other benefits include a reduction of NOX and a 33% reduction of particulate matter PM 2.5, according to the county. The county will purchase renewable diesel from Golden Gate Petroleum, which also provides renewable diesel for the San Francisco region. “Switching over to renewable diesel delivers direct reductions in GHG and lowers our carbon footprint on our planet,” said Stan Burton, Contra Costa County’s material, and recycling manager. Contra Costa County has recently tripled its purchase of electric vehicles, doubled its electric vehicle charging stations, and continues to purchase compressed natural gas vehicles, said Fleet Manager Carlos Velasquez. Other California fleets that have moved to renewable diesel include the City of Long Beach, Sacramento County, Alameda and San Joaquin Counties, City of Carlsbad, and City of San Francisco. Oregon fleets using renewable diesel include the Eugene Water & Electric Board and the City of Corvallis. Sonoma, CA— Over 150 fleet managers, vendors and members of the Municipal Equipment Maintenance Association (MEMA) in Northern California gathered at the Sonoma Raceway to learn more about NEXDIESEL Renewable Diesel from NeXgen Fuel’s Pat O’Keefe, and to attend other educational presentations focused on alternative-fuel technologies. In addition, NEXDIESEL Renewable Diesel “… goes in clean and comes out clean,” drastically reducing green house gas emissions by 50% or more as the City and County of San Francisco, County of Alameda and Cities of Oakland and Walnut Creek are finding after making the switch to NEXDIESEL Renewable Diesel in their municipal fleets and transit systems. 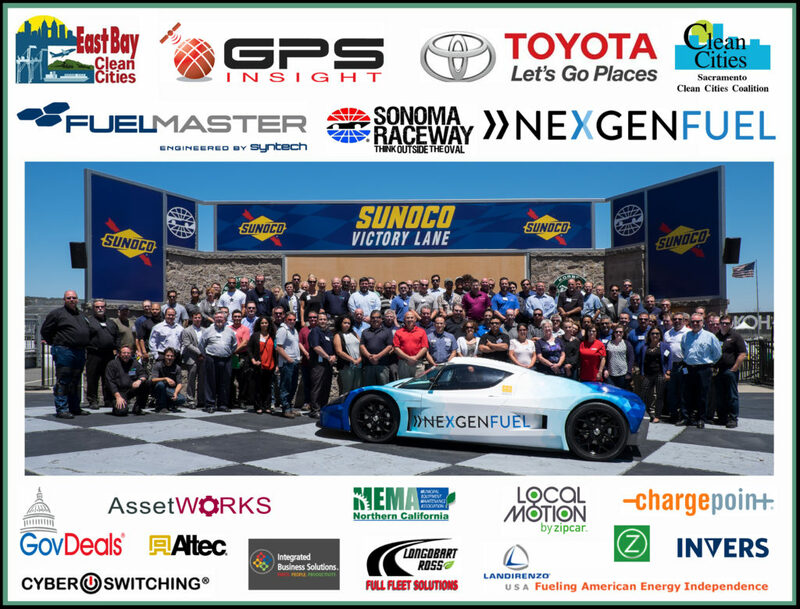 As an added bonus, NeXgen Fuel’s street-legal SLC Superlite race car, which was driven across the US from Florida to California on ONE TANK of NEXDIESEL Renewable Diesel, highlighted the potential performance capabilities of Renewable Diesel and was on hand for photo opportunities. The Next Big School Bus Alternative Fuel Is…Diesel? Article originally posted by School Transportation News at STOnline.com. Article written by Ryan Gray. Attention, all school bus operators who bristle at the thought of transitioning from diesel power to alternative fuels, there is relief on the horizon. Renewable Diesel (RD), which is available in parts of California, is turning heads, as it promises to deliver, at the very least, the same fuel economy and performance of ultra low sulfur diesel. CAL-START, in a recent webinar, claimed that RD also reduces greenhouse gas emissions by 65 to 90 percent. Pat O’Keefe, CEO and president of NexGen Fuel, a subsidiary of Golden Gate Petroleum, said that such a reduction in GHG is a “huge benefit” for a drop-in fuel. That means RD meets the same ASTM D975 standard for ULSD and engine manufacturer requirements. Renewable Diesel is similar to biodiesel in that it’s derived from waste vegetable oils and waste animal fats, but the similarities stop there. Unlike biodiesel, RD doesn’t have the same cold weather issues since RD doesn’t gel, having a cloud point of -20 degrees. They also differ in how they are made, with RD refined from biomass through various processes, such as hydro-treating, thermal conversion and biomass-to-liquid. Biodiesel, on the other hand, is produced using feed stock in a process called transesterification. Additionally, O’Keefe said that RD reduces particulate matter by a third, along with its ability be used in all modern diesel engines without any need of modifications. So far, the only school district using RD is San Jose Unified, which is located south of San Francisco. Andrew DeBolt, lead equipment mechanic for San Jose Unified, told School Transportation News that the district is in the process of transitioning its entire fleet of 72 buses to RD with plans to only purchase diesel buses in the future. Nearby in Oakland, the municipal fleet is the first to adopt RD. Fleet Director Richard Battersby, who will present on the benefits of RD at next month’s STN EXPO, said that operators don’t need to flush existing fuel tanks to use the renewable fuel. He added that it is a little more expensive than traditional diesel at an increase of about 10 cents per gallon, and availability is still an issue. But Battersby said that he expects the reduced soot emissions to improve performance of DPFs and the affect on his operation’s bottom line to be worth it. “We expect in the long run to lower maintenance costs,” said Battersby. He also pointed to RD’s higher cetane number of 75 to 90. In comparison, petroleum diesel has a cetane number of 40 to 55, while biodiesel ranges from 50 to 65. Read more in the July issue of School Transportation News magazine. In a year of firsts for the 2016 SCORE International Races, NeXgen Fuel/CLP Motorsports will lead the pack in running a trophy truck on NEXDIESEL, the purest and highest performance renewable diesel through the toughest and tortuous Mexican desert race. For the first time in history, all races will be taking place in Mexico for the 2016 season. The race series includes the Baja 250, Baja 500 and Baja 1000. In a partnership with fuel distributors Golden Gate Petroleum and NeXgen Fuel, CLP’s trophy truck will make its debut as the first-time attempt to race a trophy truck on a 100% renewable diesel. NEXDIESEL is a clean burning, high performance renewable diesel manufactured completely with bio-based feed stock. This unique alternative fuel has a chemical structure identical to traditional diesel but is petroleum-free. NEXDIESEL is the highest quality renewable diesel in the world and CLP Motorsports with NeXgen Fuel will showcase how good it really is by running it in a high-performance diesel engine. Team drivers Larry Roeseler, Pat O’Keefe and Tyler McQuarrie will be pushing the trophy truck over an extreme, unpredictable environment, enduring challenging time spans and conditions in an attempt to claim the overall race victory with this dynamic fuel. Follow the race this November. NeXgen Fuel is a new retail fuel brand dedicated to bringing next generation fuels to the retail public. NeXgen’s first fuel is NEXDIESEL. It is currently available at various Northern California retail locations. NeXgen Fuel plans to rapidly expand across the country with both renewable diesel and gasoline-substitute next generation fuels. CLP Motorsports is the premier, full-service performance facility in Northern California. CLP specializes in road racing, time attack, autocross and high-performance street cars. CLP offers customers a wide array of services including performance maintenance, product installation, fabrication, full-service builds, race car setup, product development, part sales, driver coaching, arrive and drive services and more. CLP Motorsports is the first team to race the new NP01 in a competitive race. It was designed with the idea of creating a fast and easy-to-maintain prototype style built car that would give teams an affordable price point to compete in NASA’s new NP01 Series. Larry is an American professional off-road racer in motorcycle and Trophy Truck classes. He is a 13-time overall winner of the Baja 1000, 11-time overall winner of the Baja 500 and a 10-time gold medalist in the International Six Days Enduro. He has spent the past 25 years racing and winning numerous off-road circuits, including SCORE/Tecate Baja series and Best In The Desert series. Roeseler is 2-time overall winner of the Las Vegas to Reno and has numerous American Motorcycle Association off-road titles including National Hare and Hound and National Enduro championships. Larry Roeseler is a Hall of Fame Inductee of the American Motorcycle Association and an Off Road Motorsport Hall of Famer. Pat’s successful corporate career as President and CEO of NeXgen Fuel, Vice President of Golden Gate Petroleum and CEO and President of CLP Motorsports had its humble beginning as a successful racer in his youth. His passion for automobiles and motorsports lead to an impressive racing career starting at the age of 12 where he has since raced anything with an engine including jet skis, boats, motorcycles, karts and cars with NASCAR, SCCA, NASA, IMCA and others. Pat started CLP Motorsports after realizing the need for a world class customer focused motorsports shop. He started NeXgen Fuel by recognizing the need to meet customers’ demands for a high-quality, clean-burning, high performance premium renewable diesel. Pat is continually driven to find innovative ways to champion clean alternative fuels like NEXDIESEL Renewable Diesel for use in the automotive industry. Tyler McQuarrie grew up in Walnut Creek, CA and started racing karts at age 14. He won the Formula Russell Championship, the Russell Triple crown in 1998 and is one of 3 Americans to win the World Scholarship in England. Consequently, McQuarrie spent 2 years racing the Formula Vauxhall in Europe. Tyler McQuarrie also spent time racing the USF2000, American Le Mans, USAC Sprint cars and the NASCAR West Series. He is recognized as one of the top drift drivers and best multi-purpose drivers in the US.